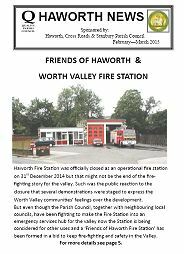 Bi-monthly newsletter to residents of Haworth, Cross Roads and Stanbury. We have been experiencing some difficulty with the delivery of the newsletter and some households are not receiving their copy (and indeed some are receiving two!). If you do not get a copy but live in Haworth, Cross Roads or Stanbury, please let us know so that we can try to address this. Either drop us an e-mail to wvcontactpoint@yahoo.co.uk or call us on 01535-644001. Also if you are able to help with the delivery, particularly if you live in Cross Roads, then we would love to hear from you. Even if you can only manage your street it would help enormously as we now circulate over 3000 copies so any additional help would be fantastic. Local Businesses and Community Groups can also advertise in the newsletter. Unfortunately due to revenue constraints we are no longer able to offer this as a free service to community groups however they will be charged at half the commercial rate. You can download the complete February - March 2015 Newsletter as a PDF document here... please note the file size is 3,700kb's. You will need Adobe Acrobat Reader 5 or higher. Back issues are at the bottom of this page. The newsletter includes a diary section, if your group has an up and coming event to promote why not pass us the details so they can be included. You can download the back issues of the Newsletter as a PDF document; you will need Adobe Acrobat reader 5 or higher.